Ian Clifton has been one of the most well-known officials in Scotland for decades. I have been on various committees at different times – eg SCCU as club representative in the 60’s, SAAA in 1977 – but Ian had been on them before I had and he stayed on them and developed his involvement long after I had switched to concentrating on coaching. Before that he had been a runner, running in Scotland and England with some success. 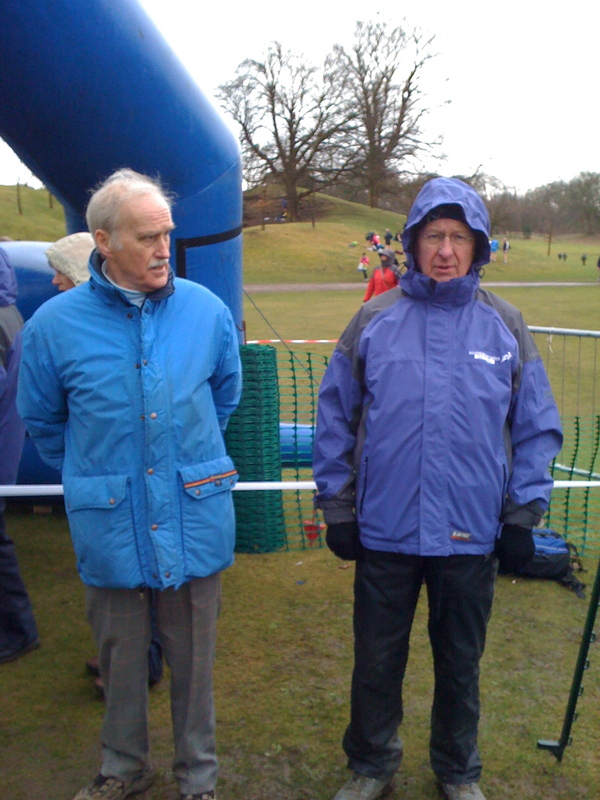 He is still, in his 80’s, officiating at cross-country events in the Scottish winter which means a lot of standing out in the typical weather suffered between October and March every year. Ian Clifton was born in Drem, East Lothian 20 miles south of Edinburgh in 1932. 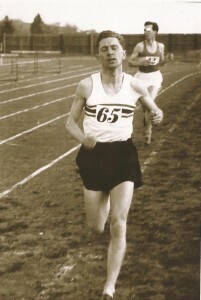 He joined Edinburgh Southern Harriers in 1947 and became their Youth champion in season 1949-50. 1949 was a good year for Ian. He won the Edinburgh Battalion of the Boys Brigade Track and Field Championship and also the Battalion Cross-Country Championship and finished second in the East District Under 17 Cross-Country championship. Clearly a runner with some talent, he was selected for the classic Edinburgh to Glasgow eight stage relay and ran on the 7th leg in November that year. He joined the Civil Service and worked in Lincoln in 1950 but that was the time when all young men – unless they were in a reserved occupation or had a deferment for some reason – had to do two years National Service. Most did it and most athletes gained something from it. Ian was called up and in 1950 and served until 1952. He had a good posting and served in Egypt from April 1951 to November 1952. While there he kept running and competed in the Middle East Track and Field Championships in 1952. On demob he in 1952 he returned to Lincoln where he joined Lincoln Wellington AC. Ian competed for them until the Civil Service posted him again in 1955 but before then he enjoyed his athletics with the club. During this period he competed for the club and also for the County team in Cross-Country events. On the track he was less fortunate: despite winning the County track trials in both 1954 and 1955, Ian was the only winner not t be selected to represent the County at the White City on the grounds that he had not been born in Lincolnshire. At that time there were several road relays sponsored by the ‘News of the World’ and Ian ran in the Manchester to Blackpool local relay and also in the bigger London to Brighton. Not only competed but was also in the team that won the most improved team award for the former. If you add in the Edinburgh to Glasgow run in 1949, Ian had the possibly unique record of having run all three NoW Relays. Away from the track, he transferred to the Customs & Excise in 1955. This was unfortunate for his athletics career as it entailed constant movements throughout the country in the course of his employment. He did however manage to compete for South Shields for a period in 1956 whilst working in the Newcastle area. His next move was back to Edinburgh in 1957 on a more permanent basis – and also to get married. He rejoined Edinburgh Southern Harriers and ran for them for some years. However it is as an official and administrator that Ian is best known. Like all officials he began with his club committee to which he was elected in the early 1960’s becoming president in 1970-71 and again in 1980-82. He was elected to the General Committee of the S.C.C.U. in 1969 and became Vice-President in 1977, and President in 1978 where, as Chairman of the World Cross-Country Organising Committee for the World Cross Country Championships in Glasgow. In 1980 he was elected Assistant Secretary of the SCCU and in 1982, he became Honorary Secretary in succession to John Hamilton – a post he held until 1995. At that point he also completed a BA degree at the Open University after four years study, graduating in 1984. He was also during this period General Secretary of the Scottish Athletic Federation Road Running and Cross-Country Federation, Secretary of the UK Road Running and Cross-Country body. This was a difficult time for the SCCU. He did not have an easy ride in the post. Ian’s spell as secretary was a time of change and there were several big events which had the Honorary Secretary, as the spokesman for the organisation and its many sub-committees, right in the front line. For instance the question of amateur status was continually raising its head with payments becoming more open and more frequent. These questions went from the six top athletes in the UK being paid £15,000 each by the governing body for up to 6 races a year right down to the payment of expenses for individual athletes attending local gatherings. At times it was mildly embarrassing for him. For instance after the SCCU Championships in 1985, Edinburgh Southern Harriers had been reported to the committee by the meeting referee. They had just completed a sponsorship deal with Marshall’s Chunky Chickens and had been wearing the sponsor’s sweat shirts with his name in bold on them. The ESH team manager Sandy Cameron was summoned and reprimanded and Ian Clifton had to face the press and tell them that ‘this is against the rules and we will be issuing a written reprimand.’ The fact that he was a member of the offending club had an irony not lost on him. More seriously, in 1987 Scotland was unceremoniously turfed out of the World Cross-Country Championships – as were England, Wales and Northern Ireland – in favour of a single GB team. This rankled with anyone involved in the sport and in 1992 the Scottish Union proposed a Commonwealth Cross-Country Championship, the inaugural event to be held at Irvine in 1994. Again, by virtue of his post, Clifton was the spokesman. ”This will again give Scots the opportunity to win a national vest,” said Clifton. ”We have been acutely aware of how badly the sport was hit by the International Amateur Athletic Federation stopping us from competing, and I am delighted for the athletes. ‘‘The matter was raised at the Commonwealth Federation meeting in Barcelona, and this week the Scottish Commonwealth Games Council’s secretary, George Hunter, has confirmed that the federation has raised no objection. ‘We already have a sponsor and venue,” said Clifton, whose brainchild the event is. ”It will be backed by Irvine Development Corporation. Then there was the transition from the SAAA/SCCU to the SAF which took several years, necessitated several public meetings and led to several stormy SCCU AGM’s before the transition was complete. These few example – money being awarded as prizes, the change from the SAAA/SCCU to the SAF, the unceremonious exit from the World Championships – are enough to demonstrate that he did not have an easy ride through these difficult years. Ian was Course Director for the European Cross-Country Championships in Edinburgh in 2003 and when the World Championships were next held in Scotland in Edinburgh in 2008 Ian contributed yet again by acting as the organiser of the officials for the event and member of the Local Organising Committee for that event. His time as secretary of the SCCU lasted until the formation of the SAF in 1992 and thereafter until 1995. During that period Ian was also President of the UK Cross Country Union 1989-92. While Ian’s first love may be Cross Country he is also an enthusiastic follower of Track & Field Athletics. In 1966 he took the exam to become a qualified Track & Field Judge – just in time for the Commonwealth Games. As a Grade 1 Track Judge and a Grade 1 Jumps Judge, Ian was appointed Chief Jumps Judge at the successful Commonwealth Games where he was responsible for introducing new measuring technology. As a result of this involvement, he was asked if he would organise the Civil Service Track & Field championship which had been in abeyance for two years. 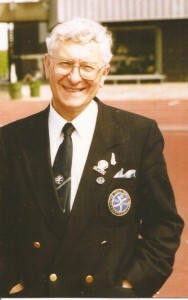 Ian took on the task and the event was held at the Civil Service grounds in Edinburgh in 1972 and at Meadowbank in 1976. He went on to become founding secretary of the Scottish Civil Service Association and was a member of the principal Executive CS Sports Council until he resigned in 1986. When the Commonwealth Games returned to Edinburgh in 1986 Ian was heavily involved as that year’s President of the S.A.A.A. A member of the British Athletic Federation from 1991-93, Ian was a Team Manager for various British teams between 1989 and 1993. Ian was a foundation Trustee of the George Dallas Trust and was awarded MBE in 1997 for services to Athletics. Having refereed many National Cross Country and Road Race Championships he is still, as noted above, very active as an official: that’s him on the right below with his good friend and fellow-official, Robert McSwein.